I am a sucker for embroidery. It’s one of those stand-out factors that instantly sets a piece! 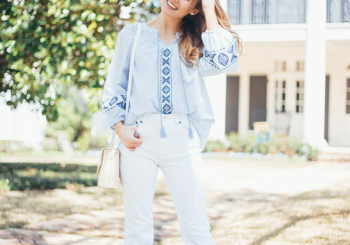 While beautifully embroidered pieces can get pricey, I hit a home run in finding this embroidered blouse from Goodnight Macaroon for under $60. It was one of the first things I packed in my suitcase for Mexico this week! 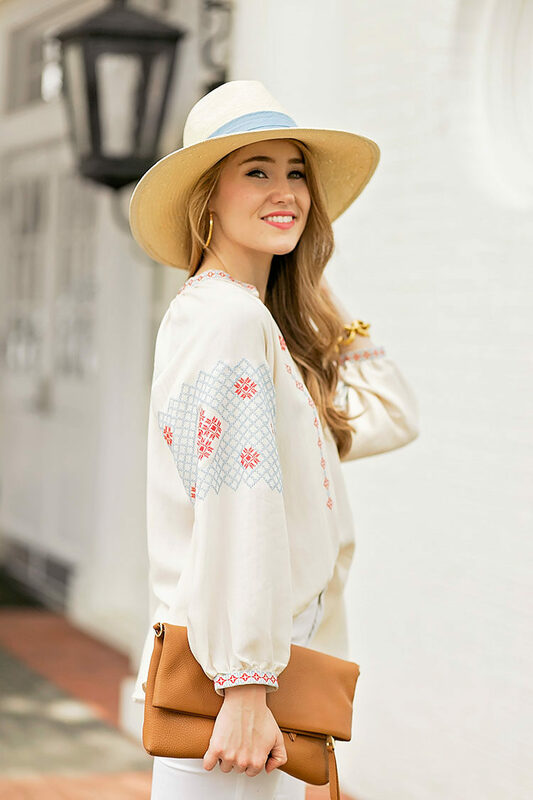 Embracing the boho feel of the design, I threw it on with white flares, platform wedges and my favorite hat for a fun, easy spring look. This top would also look darling paired with cutoff jeans, leather sandals and a cute cross body! We’re going horseback riding today, and have been instructed to wear light, long sleeved shirts. You bet my pick is this cutie! I am loving this little mountain town, and can’t wait to share more of it with y’all! The hotel we’re staying at is pink, y’all. All of the streets are so colorful, and there are art galleries around every corner. I never want to come home! Thank you, Goodnight Macaroon, for sponsoring this post. From the title of the post, I imagined something different but turns out, the blouse is even better than I thought! It’s super pretty and it looks so fresh and flowy which is perfect for hotter weather. I love flared jeans on you! I’m also a huge fan of your tan Tory Burch clutch. Great post! This outfit is gorgeous and your trip looks absolutely amazing! I’ve really been wanting to try out a pair of flare jeans, these are so cute!